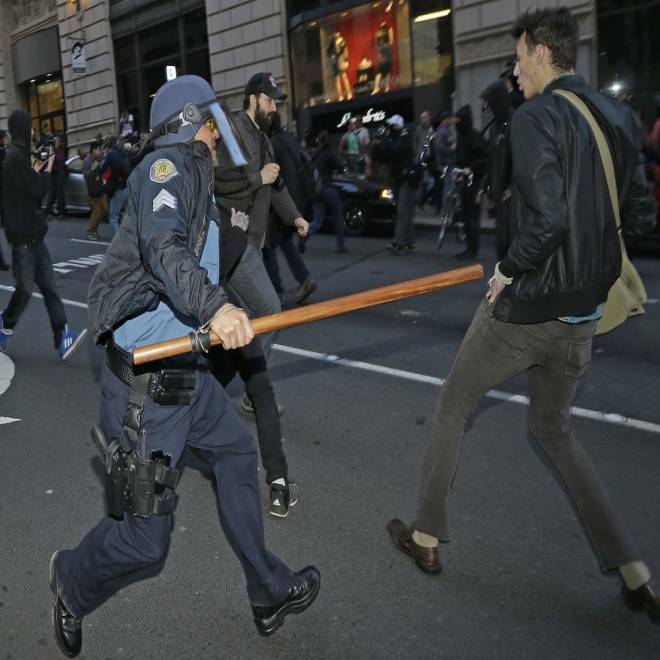 A Seattle Police officer with a baton tries to fend off protesters during a May Day anti-capitalism protest that ended with demonstrators clashing with police on Wednesday. SEATTLE -- Protesters clashed with police in Seattle on Wednesday as a May Day rally that began peacefully turned violent after dark, with demonstrators hurling objects at officers who responded with flash-bang grenades and pepper spray. 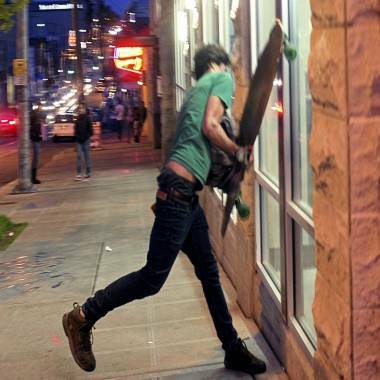 One protester was seen using a skateboard to smash windows at a Walgreens drug store in the city's Capitol Hill neighborhood, and others overturned trash cans and lined up newspaper display racks to block police. A demonstrator attempts to break a window of a pharmacy in Seattle's Capitol Hill neighborhood during May Day demonstrations Wednesday. Officers in riot gear, some riding in armored SWAT vehicles, repeatedly used the flash-bang grenades and tried to disperse the crowd. Seattle police said that as of 9 p.m. local time (12 p.m. ET), 11 adults and two juveniles had been arrested for assaults and property damage. Several people were shown on local TV stations being taken into custody. Seattle police said in a tweet that one officer was injured by a thrown object. His condition was not immediately clear. The violence broke out as darkness fell in Seattle following a day of May Day rallies in cities across the U.S. West that were planned by a coalition of organized labor activists, students, civil rights advocates and members of the clergy to call for an overhaul of immigration laws. In Los Angeles, thousands of protesters marched through downtown waving American flags and carrying signs with the slogan, "Stop deportations." The demonstrators chanted in Spanish, "Obama! Escucha! Estamos en la lucha!" ("Obama! Listen! We are in the fight! "), as they marched down one of downtown's main thoroughfares. Thousands of people across the nation took to the streets to protest for immigration reform and immigrant workers rights. NBC's Ayman Mohyeldin reports. The march spanned across more than two large city blocks, and one police officer told Reuters that unofficial estimates put the size of the crowd at roughly 3,500 people. No arrests were reported. In Arizona, where a state crackdown against illegal immigration was signed into law three years ago, several hundred people joined a late-afternoon rally outside the state Capitol in Phoenix, ahead of a march through downtown. The protests come about two weeks after a bipartisan group of U.S. senators introduced an 844-page bill, backed by President Barack Obama, that would rewrite many U.S. immigration laws. A centerpiece of the measure would create a path to legal status and ultimately citizenship for many of the 11 million undocumented immigrants in the United States. It also aims to secure the U.S. border with Mexico against illegal entry and to make it easier for industry, particularly high-tech businesses and agriculture, to hire workers from abroad when needed.